What is our hope as Christians? New Year's greetings to all of you! 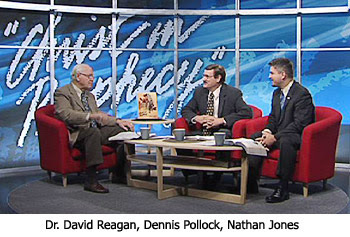 To ring in this new year, Dr. David Reagan, Dennis Pollock of Spirit of Grace Ministries and I discussed on television's Christ in Prophecy why you should be looking forward to the future with great hope. Nathan Jones: Our hope is that there is something beyond this wretched, miserable life. There is something beyond the pain and suffering that people have to endure every single day. The Bible gives us the hope that this life is more than just a breath, telling us about a never ending future of glory and wonder. We can go through a list of different topics about our future with Christ, but we can know for sure about our hope for the future. The Bible in Hebrews 11:1 says that, "Now faith is being sure of what we hope for, and certain of what we do not see." Hope, faith, and love go together so that we can have that excellent hope for the future. Dennis Pollock: As you know, in the Christian world hope has gotten kind of a bad rap in a lot of cases. A lot of people see hope as for the wimpier believers and faith for the strong believers. So, if you are really strong in the Lord you've got faith, but if you are not so strong you can at least hope for a few better things. Dr. Reagan: I didn't know I was a wimpy believer! Dennis Pollock: Now, I didn't say I agreed with that. I just said that's how a lot of people see hope. Actually, the reality is that hope and faith go hand-in-hand. Hope is very close to faith, but is not quite the same. The Bible says that Abraham in hope believed, so for him there was faith, but there was also hope. There are two characteristics about hope. First, it's future. The Bible says hope that is seen is not hope, so hope is always a look forward. Secondly, there is an emotional context to hope. The Bible uses several different scriptures to speak about rejoicing in hope. The Bible says we become partakers of Christ if we hold fast to the confidence and the rejoicing of hope firm to the end. Then Paul says we should be rejoicing in hope and be patient in tribulation. So, faith says its mine. Faith looks at the promises of God and says they're true. Christ's death on the cross, the shedding of His blood, and His resurrection means I can have eternal life. Faith believes it and marks it down as done, but hope does more than just believe it. Hope gets excited about it. Hope says, "Man, I just can't wait until it happens!" Hope also gives you the courage to endure. That's why the Rapture and hope are tied so closely together, because they say no matter how bad the world is, no matter how bad our situation is, there's a glorious coming of Christ that's going to make everything good. Peter said, "Set your hope fully on the grace that is to be brought to you at the revelation of Jesus Christ." Peter was writing to a suffering and persecuted people. Life for them was not really very much fun, and they were not very happy. But, he said to take our hope and place it entirely on the glory and the grace that's going to come to us as Christ is revealed and will one day soon appear for us. In the next part of this series on looking forward with hope, we'll delve into what our hope in Heaven actually means.